This PDF 1.6 document has been generated by ILOVEPDF.COM, and has been sent on pdf-archive.com on 23/08/2015 at 15:37, from IP address 103.5.x.x. The current document download page has been viewed 734 times. File size: 15 KB (3 pages). The binding of referencing environments; Macro expansion. and recursive types; Lists; Files and Input/Output; Equality testing and assignment. passing; Generic subroutines and modules; Exception handling; Coroutines; Events. Implementing synchronization; Language-level mechanisms; Message passing. 1. Michael L. Scott: Programming Language Pragmatics, 3Edition, Elsevier, 2009. 2. 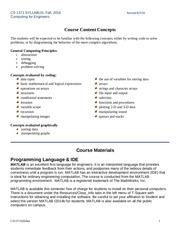 R Sebesta: Concepts of Programming Languages, 8 Edition, Pearson Education, 2008. This file has been shared by a user of PDF Archive. Document ID: 00297488.